The Shure MVi is a compact digital audio interface used to connect a microphone, guitar, or other instrument to a computer or mobile device. Audio and power are delivered through a single USB or Lightning® connection to provide a simple and portable recording solution. The MVi headphone output delivers the microphone/instrument signal for real-time monitoring, in addition to audio from the computer for playback and overdubbing. ① USB connection The MicroUSB port on the MVi rear panel connects it to a computer or mobile device through a USB or Lightning connection. Both power and audio are passed through this connection. ② Microphone or Instrument A microphone, instrument, or line source plugs into the combo XLR-¼" input. ③ Headphone Monitoring Connect headphones to hear real-time audio from the microphone and audio playback from the computer. ④ Controls The MVi touch-panel provides control of microphone gain, headphone level, and recording mode selection. The MVi is compatible with most devices that have a USB or Lightning connector. Connect the MVi to a computer or mobile device. Use the appropriate cable (USB or Lightning). The MVi is automatically assigned as the active audio device. If MVi is not the selected audio device, open the sound control panel and select the Shure MVi driver. Adjust the headphone volume on the MVi device driver. 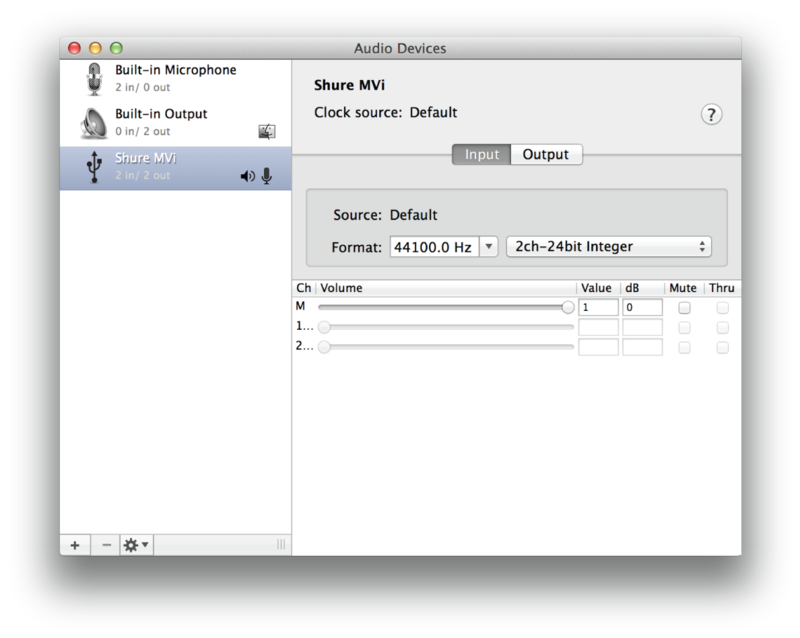 Open the Shure MVi driver from the sound control panel and raise the headphone volume from the playback or output tab. Plug a microphone or instrument into the input on the rear panel. The XLR/TRS combo input is compatible with microphones, guitars, instruments, and other line-level sources. Note: Condenser microphones require phantom power to operate. To turn on phantom power, press and hold the mute button for 3 seconds. The PH PWR LED on the rear panel illuminates when phantom power is activated. Caution: Never activate phantom power if using a ribbon microphone, as this may cause damage to the microphone. Use the MODE button to select the preset mode that fits your application and adjust the microphone gain to suit the application. 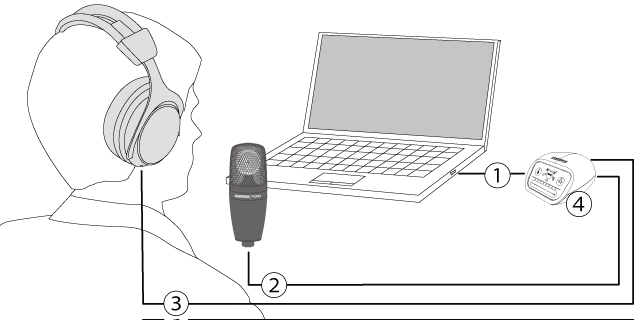 Note: When using the MVi, you can monitor and listen to playback through the device headphone output. Plug in headphones to monitor the real-time audio and playback. Pressing the headphone button changes to volume control slider to adjust the headphone volume (LEDs switch from green to orange when adjusting headphone volume). Note: Do not use the gain adjustment to get more volume from the headphones. ① Volume Control Slider Adjust microphone or headphone level by sliding your finger across the control surface. ② LED bar Displays microphone and headphone level. The LED color indicates the level being displayed or adjusted. ③ Mute Button Press to mute and unmute the microphone. ④ Mode Selector Press to select preset mode. ⑤ Headphone Volume Selector Press to select headphone level controls (orange LED bar). Then use the volume control slider to adjust headphone level. Press again to return to microphone level display (green LED bar). ① Headphone output (3.5 mm) Connect headphones to monitor audio. ② Microphone/Instrument Input Accepts an XLR or ¼" connection. ③ Micro-USB Port Connects to a computer or mobile device with the appropriate cable. ④ Phantom Power Indicator Illuminates when active (press and hold mute for 3 seconds to switch on/off). The MVi features a combination XLR and 1/4" TRS input. When a 1/4" input is inserted to an MVi, input mode switches to Hi-Z (instrument) and only flat mode is available. The flat preset mode enables the input monitor to be turned on or off. Note: When a 1/4" input is inserted no other preset modes are available and the Mode button toggles the input monitor on and off. Use input monitoring when you want to hear the input signal as you record. If you want to hear the signal after it has been effected, turn off input monitoring and monitor through the recording device. 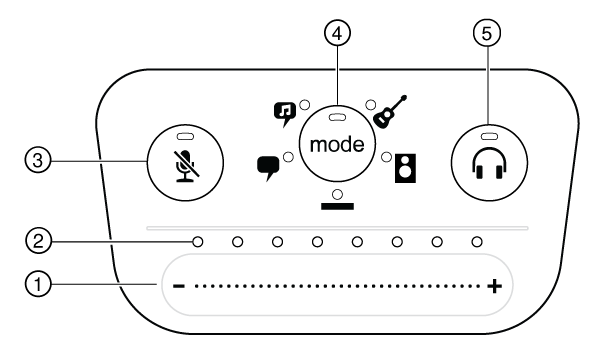 The headphone monitoring level is affected by the MVi device level and the computer settings level. Raise your computer volume up and easily adjust headphones through the MVi touch panel headphone control. Open the Shure MVi device. Under the Levels tab, adjust the volume using the slider. Select the Shure MVi device. The display does not illuminate Make sure that the MVi is fully plugged in. Audio is too low Check the computer sound control panel settings. When first connecting the MVi to your computer, make sure to raise the computer volume level. Audio sounds bad Check the sound control panel of the computer to ensure that the MVi is fully plugged in and recognized. Device not working with USB hub. The MVi requires 250 mA per port. Check USB hub documentation for current/port specification.